Two things I can never have enough of in my wardrobe–crisp white shirts and blazers. I found this pretty tie neck and blazer during the Shopbop sale a few weeks ago and love the cut. 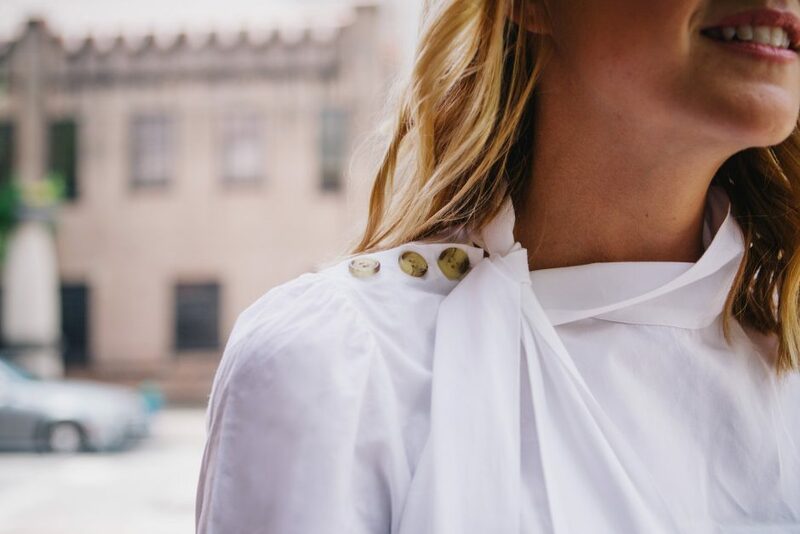 The tie isn’t the only thing I dig about this top though–it has really pretty buttons on the shoulder and the sleeves are cropped to the chicest of lengths letting us ladies show a little wrist. 😉 There’s nothing easier than a neutral outfit with a pop of color as an outer layer and this fall a blazer is about as much as I’ll need most days. And lastly, if you haven’t signed on with the white bootie trend, now’s your chance and this pair won’t break the bank!